This is one tough Scrubby! 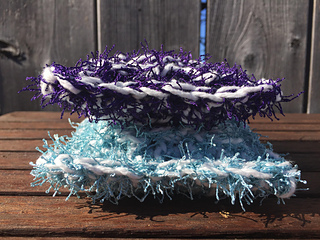 This Scrubby is double thick and features some great texture. 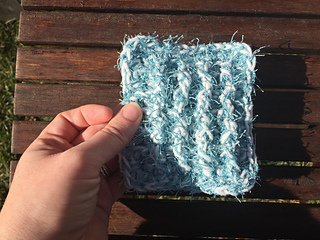 Because the stitches are worked around the posts of the stitch below instead of the top, they are extra strong! 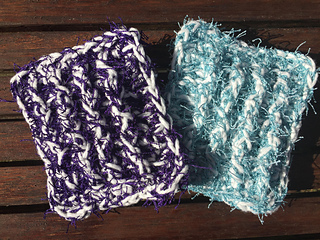 The design is worked using both one strand of cotton and one strand of Scrubby held together. 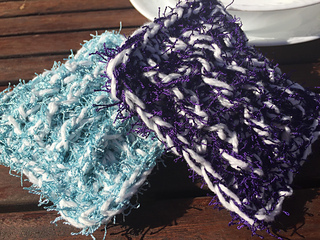 This makes it much easier to work with the Scrubby yarn. See the end of this pattern for a link to a YouTube Tutorial! 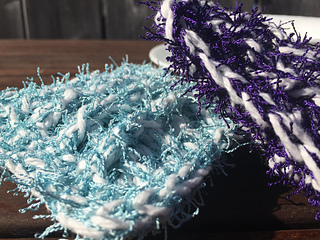 Yarn: 30 yards of Red Heart Scrubby™ (100% polyester; 100g, 85 meters / 92 yards); Medium/ Worsted weight. 30 yards of Bernat Handicrafter Cotton™ (100% cotton; solids: 50 g / 1.75 oz, 73 meters / 80 yards; 4 - Medium - Worsted weight). Ch 3 at beg of rnd counts as dc unless stated otherwise.